LAST CHANCE! Submit Your Abstract for AANA’s 2019 Annual Congress by 11:59 P.M. CT Tonight! Submission deadline: November 15, 2018 at 11:59 p.m. CT! Please note that nominations can be submitted by state associations, members and we also accept self-nominations. If your state association has already nominated members for these positions you can disregard this message. The Official State Nomination Form can be found online here. The American Association of Nurse Anesthetists wishes you a Happy Thanksgiving filled with good food, friends, family, gratitude, and a celebratory start to the holiday season! The Anesthesia E-ssential will not be published next week due to Thanksgiving, but will return the following week, on November 29. Jason Trudell, MHA, MSN, CRNA, FACHE (FL), Region 7 Nominating Committee member, submitted his resignation from the FY2019 Nominating Committee in late October. According to the AANA Bylaws it is the duty of the current Nominating Committee to elect a member from the vacant region to resolve the vacancy. On behalf of the Nominating Committee, we are pleased to report that Tracy Young, CRNA, MBA (LA) was elected to serve in this capacity. Please join us in congratulating and thanking Tracy for serving in this elected role. The AANA Education Committee is seeking candidates who are interested in serving on the committee as a Delegate. The deadline for receiving completed candidate packets is January 7, 2019. The election will be held and the winner announced at the Assembly of Didactic and Clinical Educators (formerly called the Assembly of School Faculty) meeting in February 2019. Individual peel packs are not required for instruments that touch mucous membranes. These semi-critical items “must minimally be stored in a manner that will prevent contamination.” Storing in individual peel packs is acceptable, but TJC does not require it. This storage requirement is the same even if the semi-critical item is sterilized. Keeping the semi-critical item in the sterilization package to protect from contamination is acceptable, or opening the package and storing it in another manner that will prevent contamination is acceptable. The storage container or location is visibly soiled. Staff are observed contaminating stored high-level disinfected items. Contamination of other high-level disinfected items is observed. Storage is not consistent with the item’s intended use. Items are not stored in accordance with manufacturer instructions. Items are not stored in accordance with the facility risk assessment or policy (in the event no guidance was provided by the manufacturer). For more information, read 4-1-1 on Survey Enhancements: New scoring revisions for IC.02.02.01 now in effect. Whether you have malpractice insurance coverage with us or not, AANA Insurance Services serves as a resource to all members. Learn more about this exclusive member benefit. Louis Zaragoza, CRNA, APRN, served as a combat medic in the U.S. Army during the Vietnam War, which led him to become a Certified Registered Nurse Anesthetist after his military service. A little over a year ago he joined Court Appointed Special Advocates for Children (CASA). Learn more. Last Friday, November 9, retired Colonel Laura Ludwig, CRNA, APRN, served as a keynote speaker at Brainerd High School, Brainerd, Minn., along with her father, retired Brig. Gen. Arthur Ludwig. Both father and daughter spoke about women in the military, noting that the number of women had increased since World War I, and that women veterans often feel invisible. Learn more. New! Join us in Houston, Texas, at the Royal Sonesta Houston Galleria for a deep dive into simulation for nurse anesthesia educational programs. 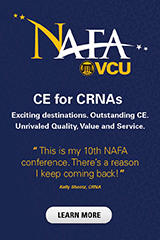 The AANA Simulation Subcommittee, led by Brett Kendon, DNP, CRNA, CHSE, has put together a relevant, full-day program, with tracks for novice and experienced users. You’ll learn best practices from the experts. Other topics covered at ADCE 2019 include the practice doctorate project, student study skills, learning and cognition, and technology addiction. Take a look at the schedule-at-a-glance for education and unparalleled networking opportunities, like the Welcome Reception. Be a part of the only forum where nurse anesthesia didactic and clinical educators can come together to share common issues and solutions. Refresh your knowledge and your love of teaching. Register by January 14, 2019, for advance registration rates. Are You "Blocked" About Blocks? 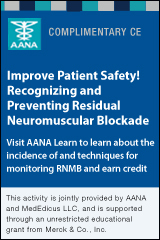 The Upper and Lower Extremity Nerve Block Workshop, March 16-17, 2019, at AANA headquarters in Park Ridge, Illinois, features didactic and hands-on training to expand your skills and expertise in upper and lower extremity nerve block anesthesia. As a bonus, included with registration, all attendees will receive Upper Extremity Blocks, written by renowned and featured speaker Charles A. Reese, PhD, CRNA. The book will be distributed on-site at registration. CRNAs participating in Alternative Payment Models (APMs) can use CMS’ Quality Payment Program (QPP) Participation Status Tool to determine whether they are included in an Advanced APM as a Qualifying Participant (QP) and check their MIPS APM status. This update covers the QPP’s second snapshot period of January 1 to June 30, 2018, for the 2018 performance year. CRNAs who are considered QPs are exempt from participating in the Merit-based Incentive Payment System (MIPS) program and are eligible to receive the 5 percent incentive bonus in the 2020 payment year. Clinicians who are in MIPS APMs are eligible to be scored under the MIPS APM Scoring Standard. Checking one’s QP status and MIPS APM status can be done in two ways: (1) as an individual using your National Provider Identifier (NPI) or (2) as a part of a group practice at the APM entity level using your group’s Enterprise Identity Management (EIDM) credentials. The updated Status Tool includes information on 11 Advanced APMs and MIPS APM in the QPP Program. Whether you are hosting your own Thanksgiving dinner, driving to grandma's house or flying across the country, this infographic breaks down the best days to travel and what to do with all the leftover turkey. Nearly everyone has heard about the Black Friday sales in November, but what about Small Business Saturday (November 24)? Learn more about this shopping day that celebrates the spirit of enterprise and entrepreneurship, as exemplified by small business owners. Bellin Health in Green Bay, Wisconsin, and its partnering organizations, have a proven track record of providing high-quality care at some of the lowest health care costs in the nation. Bellin is proud to be nationally recognized as a benchmark for clinical quality and service excellence. Our current CRNA opening is full-time (Weekdays 8:00 a.m.–6:00 p.m.), along with occasional call. The position includes working at multiple sites. Learn more. The Massachusetts General Hospital Department of Anesthesia, Critical Care and Pain Medicine (DACCPM) is seeking an experienced CRNA with leadership experience to provide CRNA staff management to ~90 full time, part time, and agency staff. Reporting directly to the Executive Director, this Chief CRNA position is responsible for the overall management of the Division of Nurse Anesthesia. Learn more. We are seeking a Director of CRNA Clinical Operations who will be responsible for managing the clinical and administrative activities of our CRNAs. This position will be full time, of which .8 FTE will be administrative and .2 FTE clinical. Learn more. WellSpan Health, a sophisticated medical community in South Central Pennsylvania, is seeking a full-time faculty member to join the staff of our Nurse Anesthetist Program at York College. Learn more. Carle Physician Group is seeking an additional CRNA to join our team of 50 CRNAs at our main campus in Urbana, Illinois. Join an autonomous and team-centered department of 50 CRNAs that perform over 19,500 cases annually at an established research and teaching hospital. Learn more. A systematic review looked at the occurrence of medication mistakes in the context of general anesthesia, which have been reported more frequently in the last two decades. The research was led by Amir Abrishami, MD, an assistant professor of anesthesia at Canada's McMaster University, and included 31 narrative reviews and 20 case studies. Abrishami's team found that errors related to the preparation, dosing, administration, or substitution of a drug are most common, while the biggest culprits are narcotic medications, vasopressors, and antibiotics. The medical repercussions include potential adverse events, significant adverse events, serious adverse events, and potentially fatal adverse events. The investigators also discovered correlations between specific medications and certain types of errors. Substitution missteps, for example, seem to plague phenylephrine, while administration and preparation mistakes often come into play with narcotics. "It's insightful to know that different types of errors can happen in different ways, depending on the type of medication in question," says Abrishami. "This kind of information can help us develop strategies to deal with these issues." Ultimately, he hopes, medication errors can be mitigated for patients undergoing anesthesia. "My next step would be looking at clinical review articles on strategies to reduce medication errors and see how effective they are," he speculates. "The answer could lie in electronic dispensing machines, double-checking strategies, or coming up with a checklist system." From "Reporting Medication Errors Increased Over Last 20 Years"
Adductor canal block may offer some benefits over femoral nerve block in patients undergoing total knee arthroplasty (TKA), based on a study out of New York. Researchers performed a retrospective review of 129 TKA patients treated with the former approach and 150 treated with the latter, comparing different outcomes between the two groups. Adductor canal block was associated with a substantially reduced rate of falls and near-falls, and these patients also experienced more meaningful pain relief. However, the femoral nerve block patients required significantly fewer opioids on the first postoperative day, and pain scores were comparable at all intervals assessed. "As we continue to improve and refine pain management techniques and do what we can from a patient safety and quality standpoint, this study points out that we can get the same, effective pain relief with less risk to the patient," according to Jeffrey A. Geller, MD, of New York Presbyterian, Lawrence Hospital Westchester. Encouraged by the findings, he and his team followed up the research with a prospective study on the effects of adductor canal block with and without periarticular injection. From "Adductor Canal Block Reduced Pain and Patient Fall Risk After TKA"
Patients may fare better under anesthesia maintenance with propofol, rather than inhaled agents, according to a meta-analysis. Researchers reviewed 229 relevant randomized controlled trials, published between 1985 and 2016, with nearly 21,000 participants total. Incidence of postoperative nausea and vomiting (PONV) was the primary endpoint, but the team compared the two approaches for several secondary outcomes as well. While the time to respiratory recovery and tracheal extubation took longer with propofol, it outperformed inhalational agents in terms of PONV risk, pain score following extubation, time in the post-anesthesia care unit, and patient satisfaction. The results appear to favor anesthesia maintenance with propofol versus inhalational agents, but the researchers stress that adequately powered prospective studies must be conducted to validate the clinical and economic relevance of their findings. From "Propofol vs. Inhalational Agents to Maintain General Anaesthesia in Ambulatory and In-Patient Surgery"
BMC Anesthesiology (11/08/18) Vol. 18, No. 162 Shraag, Stefan; Pradelli, Lorenzo; Alsaleh, Abdul Jabber Omar; et al. Research suggest that, in pediatric patients undergoing femoral surgery, pairing fascia iliaca compartment block (FICB) with general laryngeal mask airway (LMA) anesthesia alleviates emergence agitation. In a study population of 80 children, half were randomized to FICB plus general LMA anesthesia and half were randomized to just tracheal intubation general anesthesia. With FICB plus LMA, hemodynamic parameters were more stable during anesthesia induction, verbal numeric scores were lower 2–8 hours postoperatively, time to extubation was reduced, postop complications were fewer, and patients were released from the post-anesthesia care unit sooner. The results of this Chinese study indicate that FICB in tandem with general LMA anesthesia may provide intra- and postoperative analgesia to relieve the underlying pain that contributes emergence agitation in young patients. From "Effects of Fascia Iliaca Compartment Block Combined with General Laryngeal Mask Airway Anesthesia in Children Undergoing Femoral Fracture Surgery"
Journal of Pain Research (11/18) Vol. 2018, No. 11, P. 2821 Zhong, H.Y. ; Deng, X.B. ; Wang, Z. University of Michigan investigators have reported one of the first studies to find that postoperative opioid use is influenced most by the amount patients are prescribed, rather than by their pain level. The team analyzed data from more than 2,300 patients statewide during the first nine months of last year. According to the research, surgery patients receive 30 pills on average—almost four times the amount they actually use. If they are given larger quantities of opioids, meanwhile, they take more—an extra five on average for every additional 10 that are prescribed, specifically. The findings, which appear in JAMA Surgery, emphasize the impact of prescribing behaviors. "If you go to a buffet, really how much you eat is determined by how much food you put on your plate," says study co-author Michael Englesbe, MD. "I think some patients are just inclined to take all of their pain pills and then they can really struggle to stop taking them." The other troubling scenario involves diversion of opioids to someone other than the patient for whom they were prescribed, which has been pegged as a top source of opioid misuse. To combat these problems, Michigan hospitals are moving to update their prescribing practices based on the study's recommendations. From "Surgical Patients Receive Four Times the Opioids They Use, Study Shows"
Researchers have demonstrated the efficacy of using local anesthetic in endoscopic posterior decompression procedures on patients with lumbar spinal stenosis (LSS). The study involved 50 patients who were assessed one, three, six, 12, and 24 weeks after surgery. Pain and disability scores—as rated according to the visual analog scale and Oswestry Disability Index, respectively—were significantly improved one month postoperatively and continued to make progress over the next two years. Reporting in the Journal of Neurosurgery: Spine, the investigators concluded that endoscopic posterior decompression under local anesthetic is effective in the setting of LSS. From "Local Anesthetic Effective for Endoscopic Posterior Decompression for LSS, Study Shows"